Our last(?) stop before Tucson is an assignment I’ve given myself, for the magazine. There’s a little airpark in the very remote town of Rodeo NM, where a group of “Sky Gypsies” fly light sport aircraft from a 7200 ft packed dirt airstrip. While I like flying, the real reason we are here is because this park contains a small array of vintage Airstreams, polished and arranged in a semi-circle next to the runway. This is the fun part of my job. I interview everyone I see, take a lot of pictures, and then write up the experience for the blog and (eventually) the magazine. 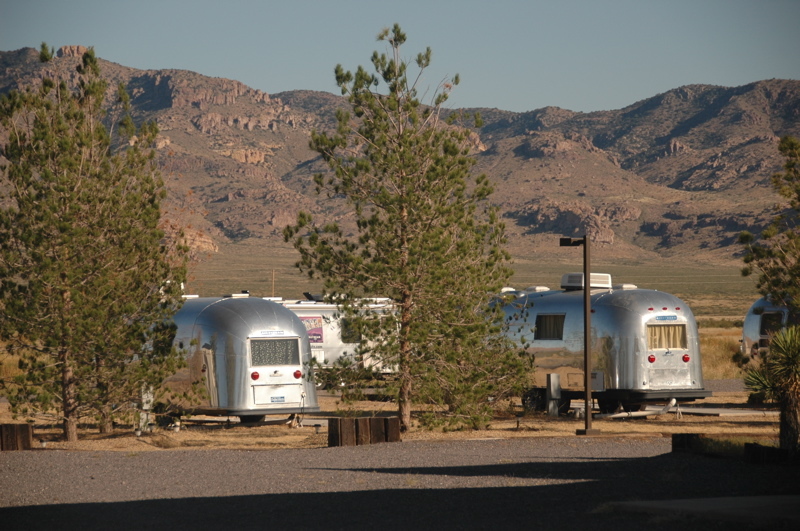 The Airstreams are housing for members of the park association as well as students who come here to get certified to fly light sport aircraft. Neil Bungard teaches these folks in Air Creation planes every morning and evening when the air is relatively calm and the temperatures are moderate. It takes about 28 hours of flight instruction to get certified, and so having the Airstreams as temporary housing is handy. 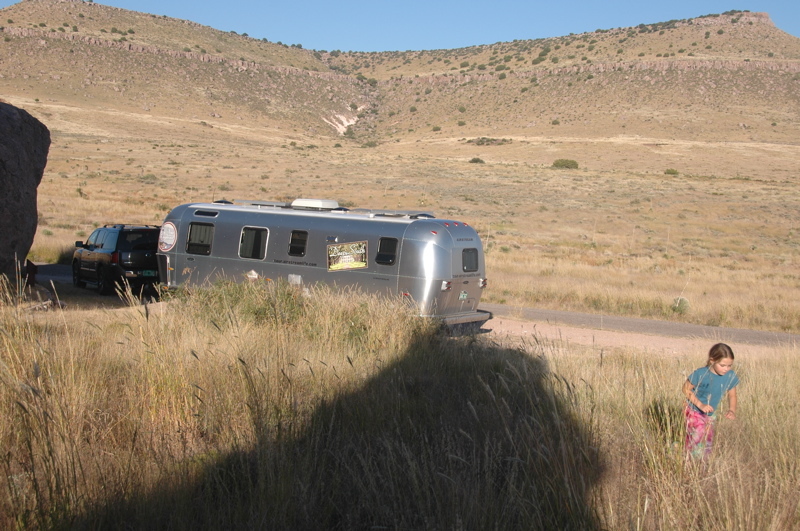 We parked our Airstream in the gravel lot adjacent to the field for a night. 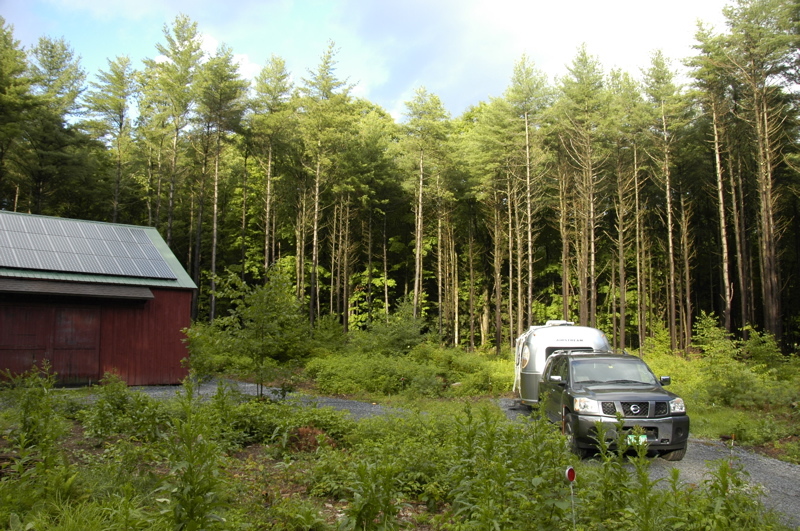 There are no hookups and no formal transient spots for visiting RV’ers, but plenty of room to just dry camp. At night it’s very quiet, but in the morning and evening it’s nice to hear the sound of little aircraft engines practicing touch-and-goes on the runway. For a pilot, aircraft noise is a good thing. We’re 30 miles from a very lonely stretch of I-10 out here. This is a quiet corner of New Mexico. It’s 60 miles to a grocery store. Apparently it’s a popular place for retired astronomers to go, since the night sky is very dark and clear. It’s also a great place for observing the natural desert world. There are lots of interesting creatures here, including giant grasshoppers, tarantulas, and javalinas. Emma found a black widow spider last night, which was exciting for her but then caused her to worry they’d climb into the trailer while she was sleeping. I’ve been watching the Nissan’s tires for a few months. They are nearly worn out after about 40,000 miles, and my plan was to replace all four when we reached Tucson. Apparently I waited a bit too long. This one seems to have failed as a result of wear, sharp rocks, and the added stress of carrying a trailer. There was a two-inch long rip in the tread, emanating from a central failure point. There was no sign of a nail or other object (other than rocks) that caused the failure. We put the spare on but it’s a solid 80 miles to the nearest tire shop, so I am taking a few steps to reduce the risk of the other rear tire going. We are going to transfer some cargo from the Nissan to the Airstream to lighten the tire load, and increase the rear tire pressure slightly. We’ll also keep the speed down on the highway today, although lately we never tow over 62 MPH. From Albuquerque south we made very few stops yesterday. We paused for lunch and a water fill at a truck stop along I-25, then for chiles in Hatch, and not much else. It’s a peculiar feeling to know that we are headed somewhere to stop indefinitely, and I think that contributed to a sense that we had no particular purpose for being on the road. When you don’t know where you are going, it’s helpful to stop and take stock. 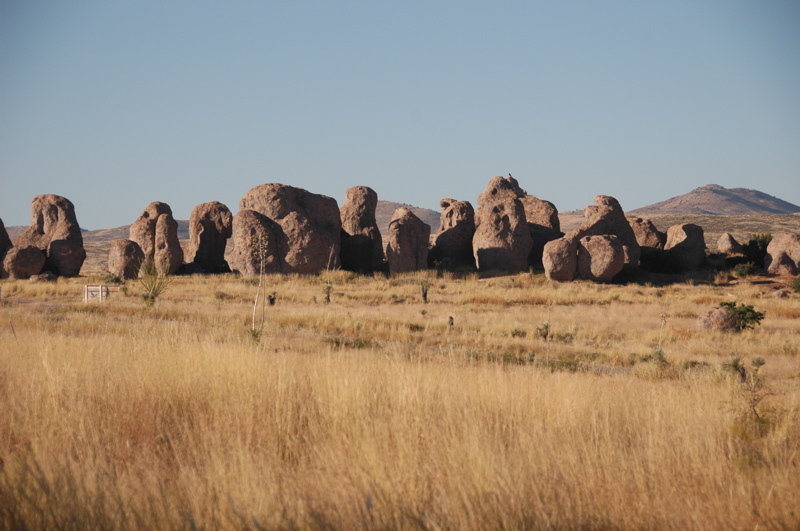 So we pulled into City of Rocks State Park in southern New Mexico for a night. Eleanor and I remember City of Rocks from our only previous visit, in early 2000 when Emma was still a womb passenger. I remembered thinking back then that we should come back sometime and camp with a tent, but we never did. Finally, we’ve come back with an Airstream and an 8-year-old. The rocks are the same, but everything about us seems different. Along the road yesterday I noticed that we’ve once again broken a belt in a trailer tire. That’s (I think) the fifth one in a year. This particular tire was a TowMax Power King, which is sold by Les Schwab tire stores. At this point I have not found any brand that seems to last longer than any other. The TowMax on the other side is still holding up fine, as are the Goodyear Marathon and Carlisle, but none of them are older than a year. The tire appears usable for now. The broken belt is revealing itself by unusually fast wear on the outer edge. In about 500 miles it will be bald there, but I’ll replace it before then. Since we had the axles aligned in August, I’m fairly sure that this is not an alignment problem, but there will be no doubt when we remove it. A broken belt causes the tire to bulge out along the tread, which is what causes the rapid wear. I’ll take pictures of the tire when it is removed, so you can see what I’m talking about. We’ve got one more stop to make on this trip, in the remote town of Rodeo, NM. It’s a tiny place 30 miles south of I-10 in a very lonely corner of New Mexico. There’s an ultralight airport based there, run by a group of flying fanatics. Students who come down are housed in Airstreams parked on the property. We’re going to head down there tonight and spend some time learning about the place and the people who run it. 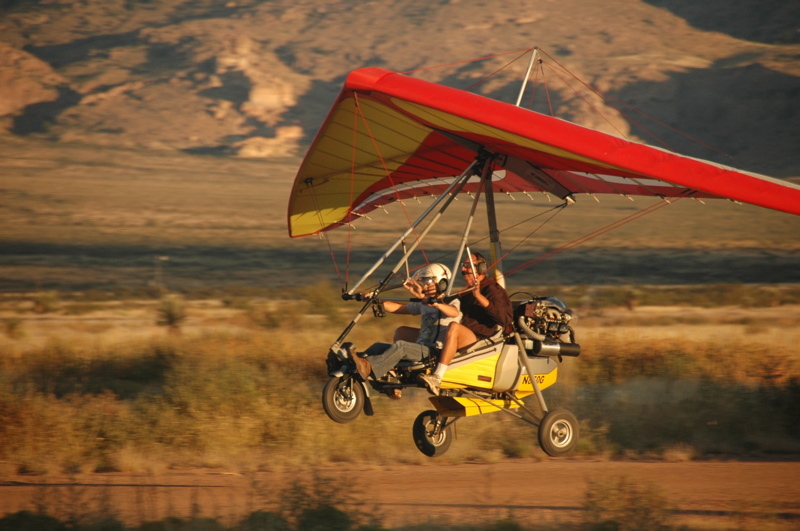 I may even get a chance to take a ride in one of the ultralights. After that stop, we will head to Tucson, wash the trailer at a local truck stop, and then park it. It needs some maintenance. We’ve got a list of about a dozen things to do for it, including repairs, upgrades, and cleaning. I have decided to extend the blog for a bit longer. In addition to having maintenance tasks to talk about, there are things that need to be said about the process of coming off the road. It’s a very emotional change for us, and I don’t want to underplay the significance of it. I also want to summarize some of my feelings about the past three years. Stopping travel (even for a little while) is a part of the process of full-timing, so it seems legitimate to continue the Tour of America blog long enough to cover all of those items. This is a chance for you to ask questions, too, so if there’s something you’re wondering about, ask away! I’ll blog our return to suburbia and all the other things over the next few days. Leaving the Grand Canyon’s north rim to Page AZ is one of those spectacular roadtrips that can only be found in Arizona or Utah. From Grand Canyon you cruise along Rt 67 to Jacob Lake, a small outpost in the Kaibab National Forest that is a nice destination in its own right but massively overshadowed by the Grand Canyon 47 miles away. From Jacob Lake the road descends on Alt. Rt. 89, passing from Ponderosa pine forest, past gorgeous views of the Vermillion Cliffs, and eventually to high desert. 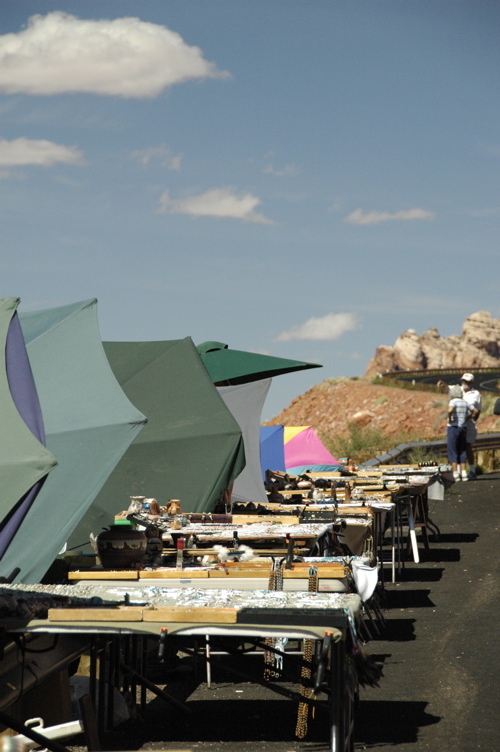 At a viewpoint near the Vermillion Cliffs, just after entering the Navajo Nation, there is a large pullout where Navajo women have set up stands to sell art and crafts made by dozens of Navajo artists they represent. The stop is worth making just for the views of the Vermillion Cliffs — the best view we’ve seen yet — but the items for sale are also beautiful. A bit further you pass the little outpost called Cliff Dwellers, where there is a small motel, a restaurant, and a few homes butted up against the red stone of the cliffs. Amazingly, fly fishing in the perennial streams of the nearby canyons seems to be the major attraction of Cliff Dwellers. 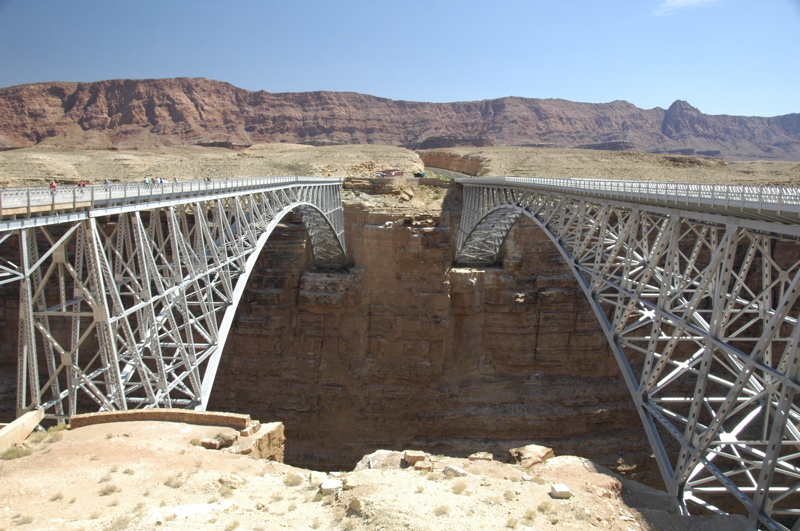 The road bottoms out at about 3,000 feet at Navajo Bridge, which crosses the Colorado River at a narrow spot above a very tall gorge. 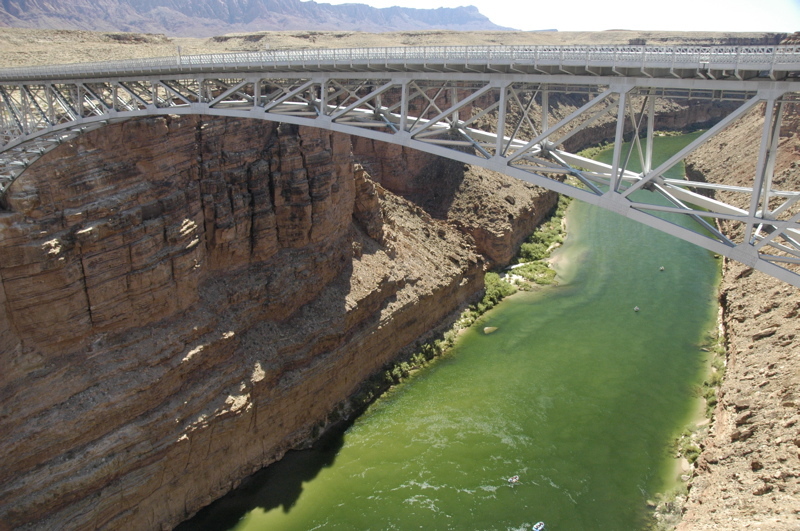 The bridge, originally built in the 1920s, is a steel arch type which appears to hang 700+ feet above the deep green water of the river below. Actually, it was replaced in 1995 by a larger but nearly identical bridge, and so you can now walk across the old bridge for the view. Well worth the stop, but keep in mind that there’s no RV parking. We “invented” some along the exit road and the ranger on duty did not mind. There are covered picnic tables near the bridges so it makes a nice lunch stop. From Navajo Bridge the road climbs again to the south, until Alt Rt 89 joins Rt 89 and you have a choice: Flagstaff or Page. We turned left (north) to Page and immediately began a climb through the red cliffs where pullouts give you an outstanding view of the plateau below. The road slices through a notch in the cliffs and you’re back up at 6000 feet. Then it slowly descends down a tilted plateau to Page. Page was originally a workers town for the builders of the Glen Canyon dam that formed Lake Powell. When the dam was proposed, there weren’t any towns for 80 miles, no roads, and no rails. Today it’s a modern town with golf courses and marinas on Lake Powell, but it’s still a long way from anything. This, plus the fact that it is located smack in the middle of some of the most beautiful landscape in the southwest, makes it a popular stop for RV’ers. 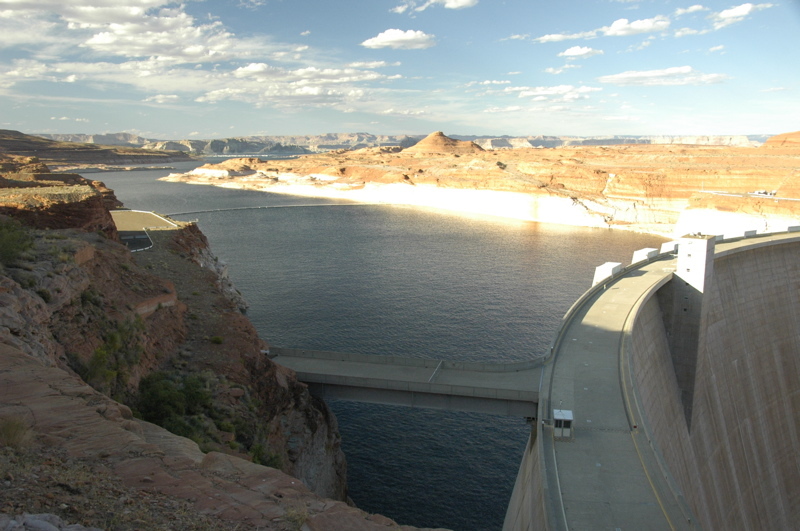 The National Park Service offers a free 45-minute tour of the Glen Canyon dam, and this is another stop well worth making. The views from the bridge and from the Visitor Center are breathtaking on a nice day — and it’s usually a nice day out here. Emma snagged a Junior Ranger badge there, too, in about 90 minutes. The last time we were here we stayed at Wahweap Marina on the shore of Lake Powell. It’s a very nice spot, but this time we wanted easy access to services. The Super Wal-Mart on the main road is unbelievably convenient, with a Shell station across the street that has an RV dump, fresh water, propane, gas, diesel, and air. We needed three of those things, plus a bunch of supplies at the Wal-Mart. Last night while taking a shower I noticed the water was extremely sluggish going down the drain. Not surprising, since I live with two females who have long hair, and we have to take apart the bathroom sink trap two or three times each year to remove clogs of hair. But the shower drain is not as accessible, which is why we always have a small screen in the drain to catch hair. So what was the problem? We tried a jug of liquid drain stuff last night but there was no effect at all. This morning we ran into the Wal-Mart for a snake, and it was a bomb too. It hit the pipe walls at the trap and wouldn’t go any further. Then we got a plunger and applied some effort with that. The plunger yielded some small improvement, plus a lot of sand regurgitated by the drain. Aha! We washed off some dirty feet back at Great Sand Dunes National Park last month. We think that, combined with the other things that go down the drain, the sand had formed a clog that corrosive drain cleaners couldn’t touch. At this point the shower is usable but still slow. 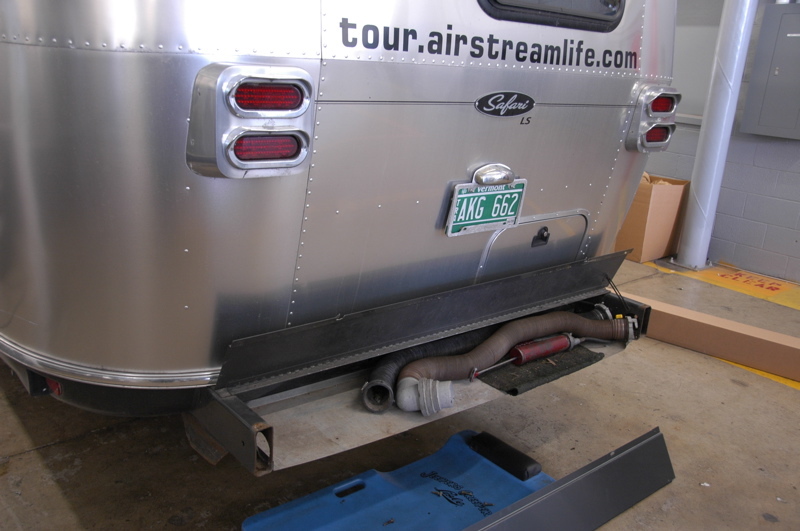 We could have an Airstream dealer take apart the drain (requiring opening of the belly pan beneath the trailer), but first we’re going to try to use the water hose at the Shell station to push the sand through the trap. That requires removing the lower half of the bathroom window, then the screen, so we can snake the hose into the bathroom, but I’ve done it before and it should be reasonably straightforward. This is what on-the-road maintenance looks like sometimes. I mentioned in a previous post a couple of weeks ago in Ohio that we had a valve stem go bad on us suddenly. We were driving up I-270 in Columbus in moderately heavy traffic when suddenly the Doran 360RV tire pressure monitor started beeping. At the time I was curious why a valve stem would fail, and so I later inspected the remaining stems. It turns out that they dry-rot over time, and it really is good advice to replace them when you buy new tires. But of all the tire shops we have been forced to visit over the years, nobody has ever recommended new valve stems to us. The only shop to replace a valve stem, to my knowledge, was the little local place in North Carolina where we had our most recent flat repaired. Instead of the all-rubber stems that came with our trailer, which are apparently best for low-pressure use, this shop put in a high-pressure valve stem (pictured at right). It’s more durable and flexes less. It’s also more appropriate for tires that run at 60-65 psi, like ours do. That was Stem #1. 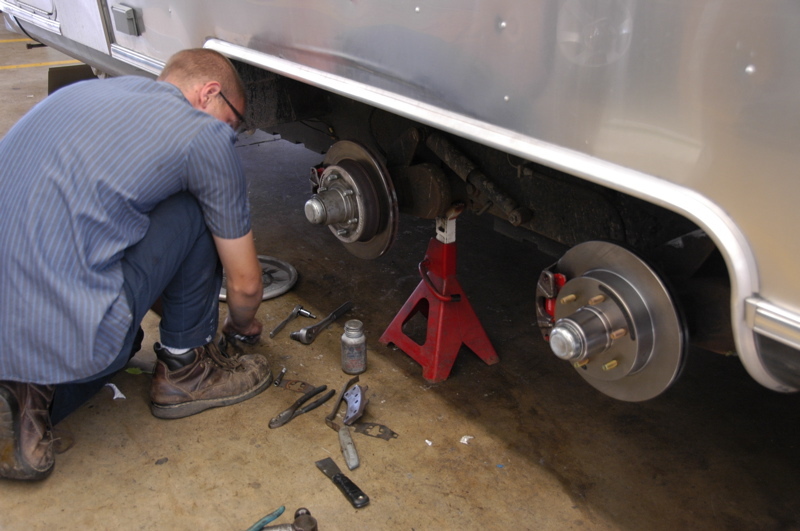 When the valve stem failed in Columbus, I asked Airstream’s service center to replace it with a “metal” one. They did, but they took me literally and installed an all-metal stem. I should have asked for a “high pressure” stem instead. The metal stem is OK but it is a little longer than the others and that makes checking the tire pressure harder than it should be. That was Stem #2. On the drive last week from Goodland KS to Aurora CO on I-70, the Doran started to beep again. Our left rear tire was running at 53 lbs. We aired it up at a truck stop and it seemed to be holding pressure, but I noticed that another tire’s valve stem looked very bad. That’s a picture of it at left. You can click on it to make it larger. Notice the extensive cracking around the base. Now I was starting to get the picture. After some period of total neglect, our valve stems were gradually failing one by one. The shop in North Carolina noticed it and replaced one in May, then a second failed in Columbus in August, and now here was a third one needing replacement. When we left Cherry Creek State Park yesterday, the Doran once again warned me of a low pressure tire. The same tire that had been low on I-70 was low again. It had lost 14 psi of pressure in five days. Clearly, we had a leak. I aired it up with my little 12-volt compressor and we drove down to Castle Rock (midway between Denver and Colorado Springs) and dropped in on a tire shop to have it checked. (Turned out to be a staple in the tire, fortunately patchable.) For the record, that’s our fourth incident of road debris penetrating a tire this year. 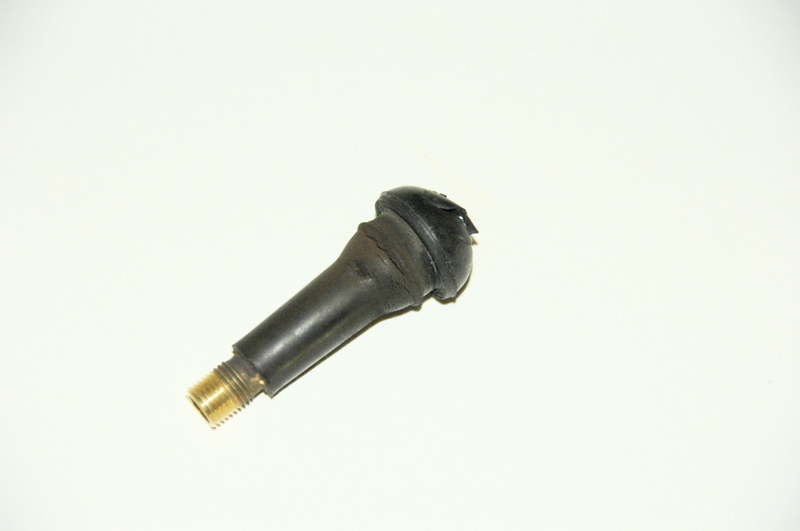 While we were there, I asked them to replace the valve stem pictured above — #3. The fourth one looks good for now — it may have been replaced in the past year by someone, I don’t know. But I’m going to replace it with a new high-pressure stem too, just to be sure. Should have done it yesterday, but for some reason the idea escaped me until we were departing. The technician strongly recommended that we use nothing but “high pressure” valve stems in the future, and that we replace them every time we wear out the tires. Only problem with that is that we never seem to wear out tires anymore — they all get killed by road debris before they can wear out. So I’ll just make a point of having the stems replaced annually as we continue our Tour of America’s Tire Shops. Things start early at the service center . At 7 a.m., anyone who is ready to go will get hitched up to a green John Deere tractor and hauled into a service bay — it’s first-up, first served. We rushed around to get all four of us up and out, and when we were more or less dressed, I went over to the service desk to tell them we were ready. Two minutes later, the tractor was hitching up. I knew we were going to face some heavy expenses related to the scrape I had last January on the way to Quartzsite, and the recent bumper tweaking in New York. The guys here felt that the bumper would be hard to straighten, in addition to needing welding, and probably would never be quite right again. After considering options, I finally decided to go with a new bumper ($337 – ouch). The old bumper, covered with irreplaceable stickers that memorialize our travels, will be shipped to our home base for permanent display in the garage. In the photo at right you can see what an Airstream looks like without any bumper at all. The other repairs planned were relatively minor. We had the replacement valve stem on the tire that went flat yesterday, bending the rear scrapers straight again, replacing some trim and the bumper compartment cover ($79), and the Dometic refrigerator recall kit (free). But there was a surprise as well. When the tech took off the spare tire we had hurriedly put on by the side of the highway yesterday, they saw that the disc brake rotor was completely shot. The disc brakes have inner and outer brake pads, which are supposed to slide on a bolt so that they both apply evenly and wear evenly. This particular set of pads seized up so that only the outer pad was wearing, and it wore out so completely that it scraped the rotor beyond repair. That added a lot to the repair list. We pulled all the other wheels off and found no similar problems, but the front axle’s disc brake pads were wearing more than the front, and it seemed time to replace those pads at least. I decided to replace all of the pads so we wouldn’t be doing this job again soon. 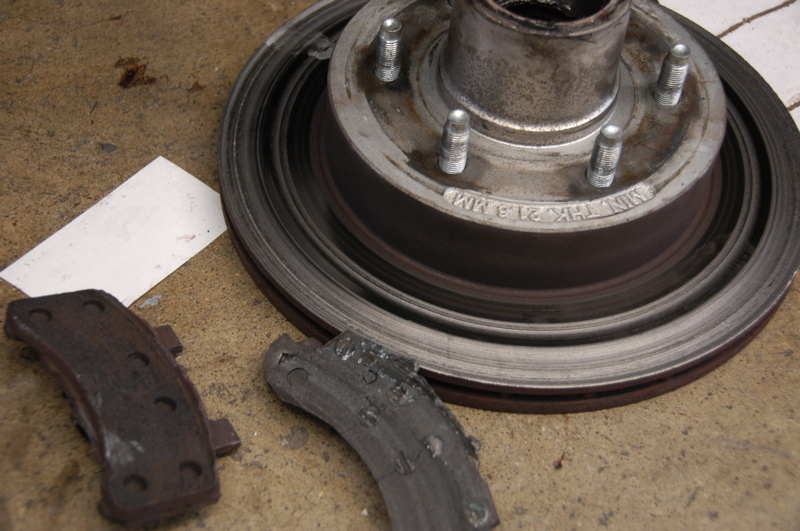 The semi-metallic pads we have been using have lasted about 20,000 miles (not bad). This time we are installing ceramic pads, which should last even longer. So the bill has been increased by the cost of eight ceramic pads plus a complete hub/rotor assembly. This is going to be an expensive day. 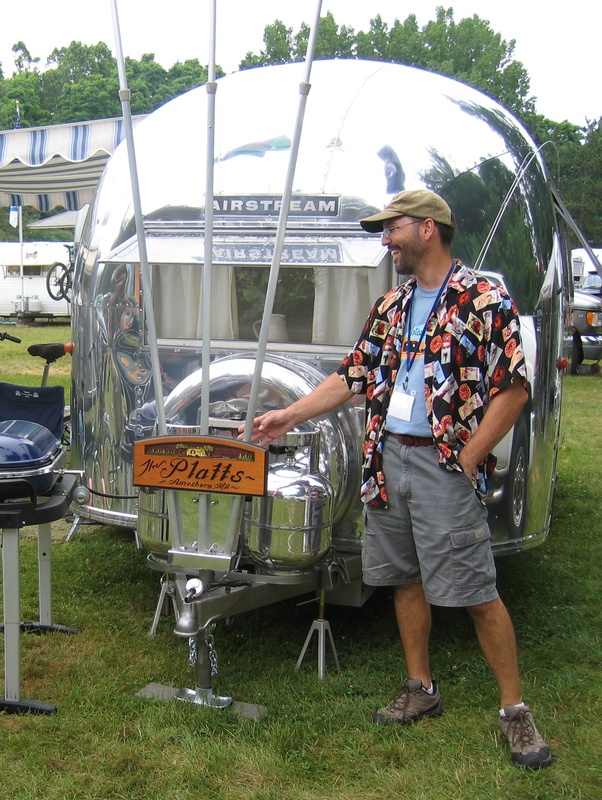 Well, we’ve always tried to maintain the Airstream to a high standard. We have to, because we use it so much. I’d much rather do preventative maintenance here in Jackson Center than have to find some place along the way in an emergency. The good news is that the tires all look perfect. I was worried about losing another tire to belt breakage, since we’d had several failures of that type last year. So far, the wear looks good. Still, I’ve requested the service center to check the axle alignment before we go. As I write this the work is ongoing, so there may be more to it than I know right now. I’ll post another update tomorrow. We left Lou & Larry’s with some regret today, and lots of apologies for not planning a longer stay. We always seem to whiz through and next time we’ll try to stay longer to explore things in their corner of Ohio. We picked up Brett at Columbus’ airport, because he’ll be traveling with us for the next week (for business reasons), and then towed over to Jackson Center OH, where Airstream is still cranking out new shiny trailers after many decades here in the soybean fields. The excitement of the day was incidentally received along I-270 somewhere in Columbus. The Doran 360RV tire pressure monitor starting beeping and showed that the right front trailer tire was suffering a rapid de-inflation. In other words, a flat was imminent. I pulled over to the shoulder immediately because the tire was already at 23 psi and I didn’t think we’d make it to the next exit. The quick stop saved the tire. It was very low but still in one piece when we stopped, rather than shredded into lots of expensive rubber parts. The problem turned out to be a bad valve stem. Doran recommends using metal stems, but three of ours are currently rubber. One failed rather abruptly (leaking around the base of the stem), and if we had not had a tire pressure monitor it would have likely come apart and possibly damaged the trailer in the process. Brett and I executed a fairly quick tire change right there in the shoulder, which is always disconcerting as cars and trucks rush by at 65 MPH. All went well, and 80 miles later here we are in J.C., with one more item on our service list for tomorrow. 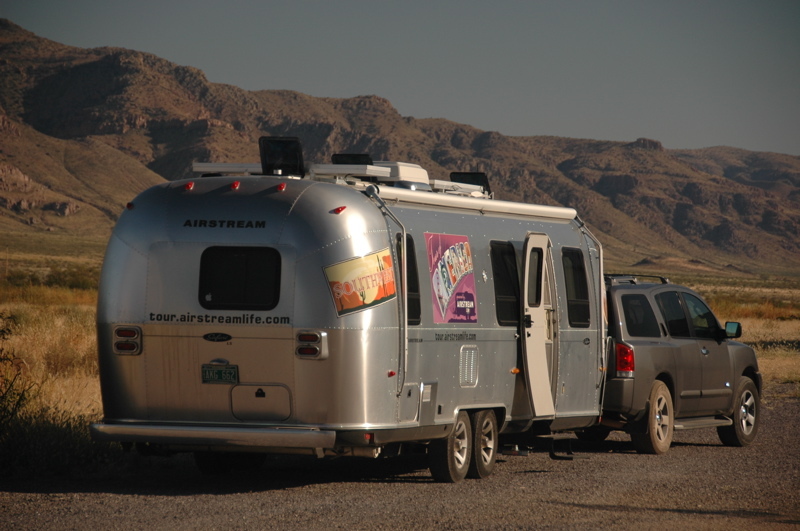 By tomorrow we should also have the password for Airstream’s free wifi, and I won’t have such difficulty posting the blog. At the moment I am using my Verizon card, which works sort of in the Terra Port. We can’t seem to escape the rain, even when the sun is shining. A big thunderstorm showed up around dinnertime, and it never really stopped. I had hoped for a letup overnight so that we could roll up a dry awning, but we awoke to a steady drizzle. Packing up and hitching up in the rain is one of the things I don’t miss when we are out west. Everything takes longer, and there’s lots of muck to deal with: mud on the electric cord, gravel sticking to my shoes, tree leaves stuck to the awning, and cold wet hands until the job is done. With the awning rolled up wet, I have to deploy it here in our courtesy parking spot in Saratoga Springs NY. It will probably get even wetter as a result of morning dew, but I am hoping for sunshine in the morning to dry it off. Rolling up the awning when wet is no problem if you unroll it later and allow it to dry. If you leave it rolled up, trapped moisture and organic debris (leaves, pollen, bird droppings, bugs, etc) can allow mildew growth. I tried to clean off all the gunk as I rolled it up this afternoon, but there’s always something. We’re taking an easy stop tonight, at the home of Bruce and Virginie, just a few miles from the site of the Vintage Trailer Jam. Bruce reports that here it has hardly rained, which is incredible. Some sort of magic barrier has divided the frequent rain showers to go around Saratoga Springs the past few weeks. But it’s not dry: we got a sun-shower when we arrived here, and at sunset the forest filled with fog. We haven’t run the water heater in weeks. This evening it refused to ignite, which is a problem we have had in the past when camping in the east in damp conditions. Something about it doesn’t like moisture. Around Christmas 2006 in St George Island FL we discovered that half an hour of sunshine or a hair dryer would bring the water heater back to life. So we borrowed a hair dryer from Virginie and in just a couple of minutes the water heater was fine. I will get a hot shower in the morning. It was hard to say goodbye to our family today, but we’re going to have souvenirs of our driveway visit in Vermont for weeks. The spiders around there were innumerable. 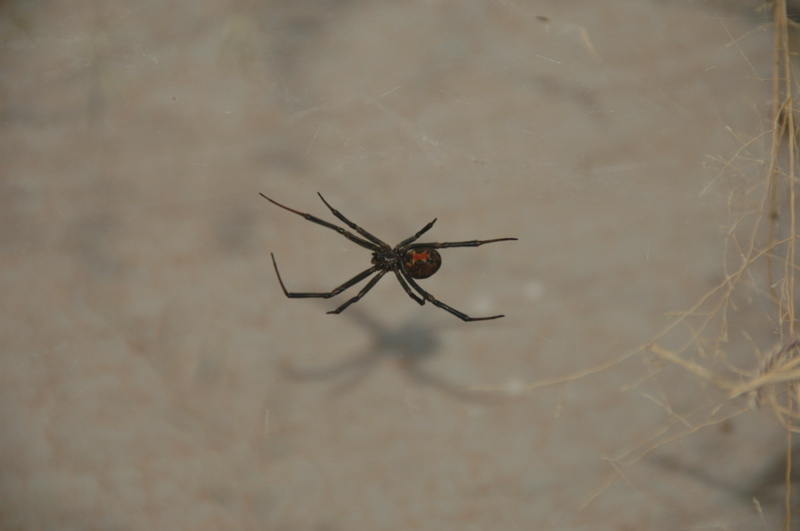 Everywhere I looked I found a spider or three, and often they had laid egg sacs too. They were on everything, and in every crevice. I cleared them out of the water heater, the wheel well, even the foam “pool noodle” we put on the awning arm. Such fun. We’re living in an insectarium. The photo above is a flashback to the Vintage Trailer Jam. People are still sending me photos from the event, which is fun. This photo just came from my mother via email this evening. Since we are parked in the same town, it felt appropriate to run in today’s blog. This Saratoga Springs stop is just an overnight. We’re going to start roaming central New York tomorrow. 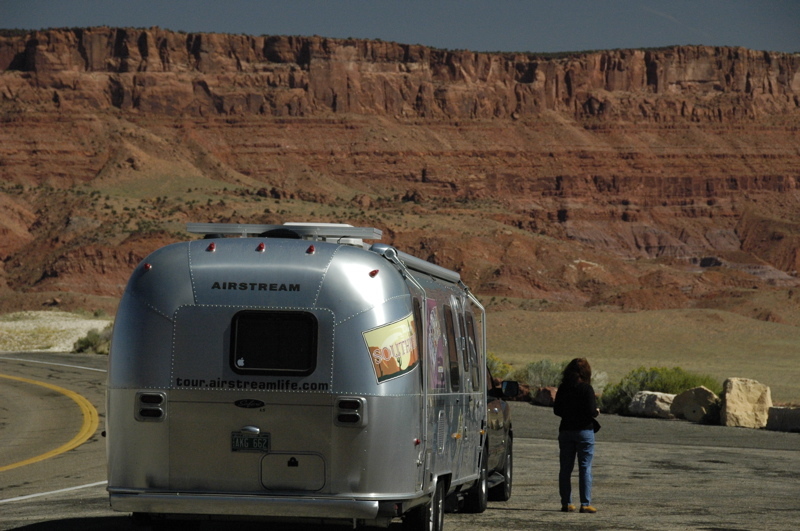 For the next week we are going to meander slowly toward Jackson Center OH, home of Airstream. We’ve got a service appointment for the 11th. Until then our primary job is to visit as many friends as we can along the way. It spreads out the driving and the fuel cost, and our indirect route means we’ll see a lot of the countryside. That’s a good deal all the way around.